Google has released the final developer tools for Android's next version and announced that it will be named Marshmallow. Google outlined most of Marshmallow's capabilities back then, but it provided more information on Monday, including that the OS has a new model for requesting user permissions. Instead of asking users for permission to do everything when they install an app, Marshmallow apps can ask for access to features like location information and the microphone when they're needed. Developers running the beta version of Marshmallow -- also known as Android 6.0 -- on a compatible Nexus device will get a new over-the-air update as well that includes a number of changes over its predecessor. Google says that most of the changes are minor, though a couple of the bigger updates include the finalized user interface for requesting new permissions and tweaks to the new fingerprint recognition functionality. In addition to the availability of the Android 6.0 software development kit, Google also released version 23 of the Android Support Library, which allows developers to implement features enabled in Marshmallow while remaining backwards-compatible with other versions of Android. The Google Play Store has been updated to accept apps that target the new Android Support Library, so developers can start sending out any apps they've built for compatibility with Marshmallow. The company recommends that people releasing a Marshmallow compatible app roll it out as a beta test first before deploying an update to all of their users. However, developers can choose to send a Marshmallow-compatible update to everyone starting today. 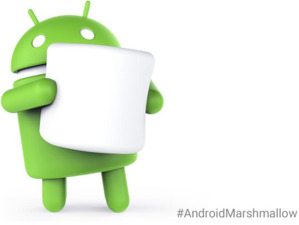 Consumers will still have a while to wait before they get their hands on Marshmallow. The operating system is slated for launch this fall, and users will then have to wait for smartphone manufacturers and mobile carriers to adopt the update before it's made available for their phones. While the developer preview of the operating system is in a nearly finalized state, Google said consumers shouldn't run out to install it on their devices, especially since doing so would require them to erase and restore their device in order to get over-the-air updates to Marshmallow's consumer-centric branch. The announcement comes about a month before Apple is rumored to be hosting a press event where it's expected to announce a new version of the iPhone and consumer availability of iOS 9, the next version of its mobile operating system.